The Burkhardt wood gasifiers run on wood pellets according to the EN Plus A1 specification only. This specification defines the composition of the pellets in terms of, for example, water and ash content, size and ash softening point. In turn, this very homogeneous fuel allows for a very homogeneous gasification process and thus enables the smooth, long-term operation of the plant. The wood pellets are also more compact and easier to store (no drying and turning in advance is necessary). How are Wood Pellets made? They are the fuel that powers our wood gasifiers. And perhaps you use this same fuel to heat your home: wood pellets. At first glance, they may seem rather inconspicuous - but they can pack quite a punch and are the secret to the success of our company. But how are they made and what motivated us to choose pellets of all sources of energy? We commissioned five BURKHARDT wood gasifiers at the wood pellet manufacturer Jürgen Freytag GmbH & Co. KG and took a glimpse at their production line while we were there. Jürgen Freytag GmbH & Co (www.freytag-group.de) has been around since 1986 and specialises in producing and selling firewood and wood pellets. It is also possible to generate power with these pellets using BURKHARDT technology. As the name suggests, wood is the raw material of wood pellets. You can use sawdust, wood shavings or even trunk wood, depending on the pellet quality you want to achieve. BURKHARDT wood gasifiers use biomass pellets out of trunk wood and waste timber from sustainable forestry, which makes them a renewable resource. 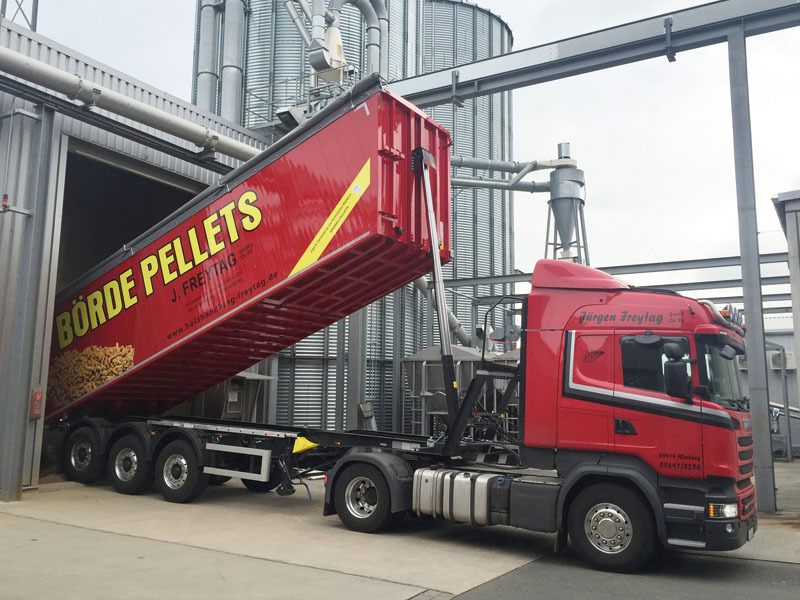 Europe-wide standards guarantee high pellet quality. 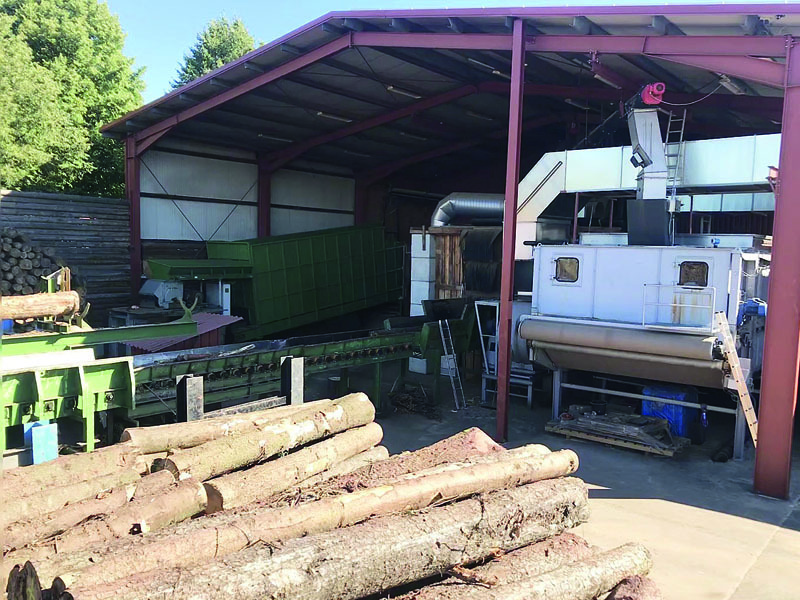 Local forestry companies deliver wood chips made from trunk wood and waste timber to the manufacturer, who first dries the bits of wood using the wood gasifier's residual heat. The goal is to reduce the water content of the pellets to a maximum of 10 %. In the next step, a metal and heavy particle separator frees the wood from stones and metal waste such as nails and rifle ammunition. Then, a hammer mill breaks the “clean” wood into even smaller chips of less than 6 mm. The manufacturer then adds water again to get a uniform moisture content of 10 to 15 %. Now, this wood mass is ready to become wood pellets. The core of the pelletizer is the pellet mill. Here, the line feeds the chips from above and rotating steel drums press them through the holes of a die. The heat from the friction – approx. 110 °C – activates the lignin in the wood. This activated lignin acts as a glue, stabilising the wood pellet. A cutter then shortens the wood pins to approx. 30 mm and the pellets harden as they cool down. In the last step, a screener removes fine wood particles that would diminish the effectiveness of the pellets. These particles go back to the production line. The uniform size and composition of the wood pellets is crucial to the success of the BURKHARDT wood gasifiers. Their homogeneous energy content of approx. 5 kWh/kg (2 kg of wood pellets have as much energy as 1 litre heating oil) ensure homogeneous gasification processes and wood gas of consistent quality, which CHPs can later use to generate heat and electricity. 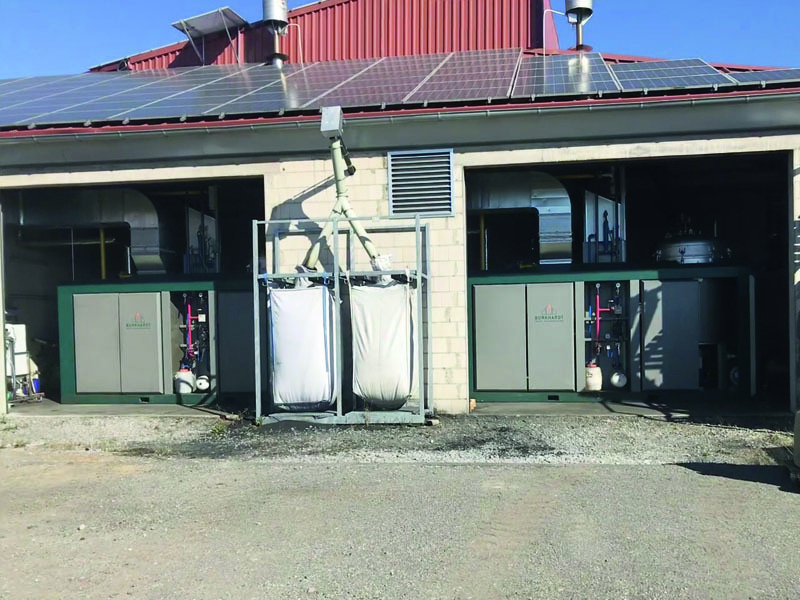 Five wood gasifiers in operation. The Freytag Group operates five BURKHARDT wood gasifiers and ECO 180 HG CHPs with a total output of 1.35 MW heat and 0.9 MW power. It uses this heat in the drying processes described above and to heat the office facilities. The power is fed into the public grid and therefore monetized.